The Commonwealth War Graves Commission is responsible for marking and maintaining the graves of those members of the Commonwealth forces who died during the two world wars, for building and maintaining memorials to the dead whose graves are unknown and for providing record and registers of those 1.7 million burials and commemorations found in most countries throughout the world. During the Great War graves were initially marked with simple wooden crosses, as illustrated here. When the permanent cemeteries were established after the Armistice these wooden crosses were sent to the families. This one, which is in Naunton, Gloucestershire, has ne connection with Eastleach but is a well preserved example. 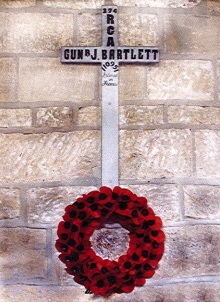 Gunner Bartlett is on the Great War memorial stone in Naunton church, where Alber Lockey is also recorded.